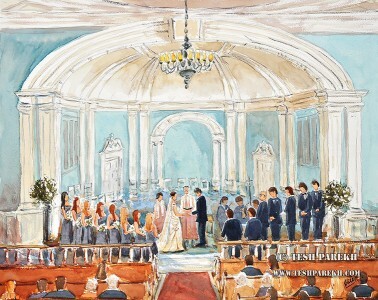 My latest live wedding painting is of Jennifer and Ben’s beautiful wedding in Chapel Hill! Earlier, I had done a live event painting in Chapel Hill at Top of the Hill Restaurant. That one was an oil on linen for the launch of Wish Upon a Wedding NC. Jennifer and Ben’s wedding was at the gorgeous University United Methodist Church. The reception was at the Carolina Club in Chapel Hill- a beautiful venue. Angie Wright of Chic Details Weddings and Events was the wedding planner for this fantastic event. Here I am sketching from the balcony next to videographer's camera. I liked the view from front of the balcony. Since there was not enough space to setup an easel I sketched with drawing board in my lap. On my right is my sketch book. 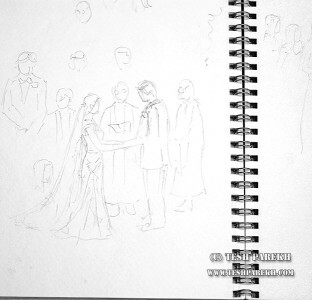 I made several reference pencil sketches before and during the reception. I love these sketches as much as I love finished paintings. 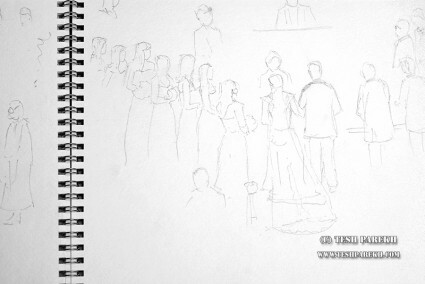 These sketches are from the direct observation. I use these as reference when I finish the painting. 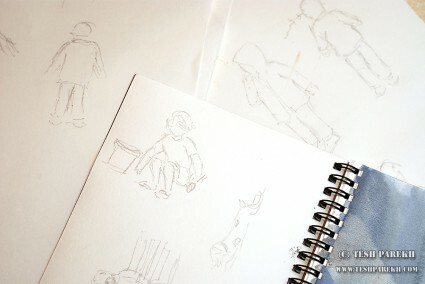 When I sketch I do not focus on what will go in the final painting. I make that decision after I analyze my sketches. This is what makes my painting process different from other live event artists. 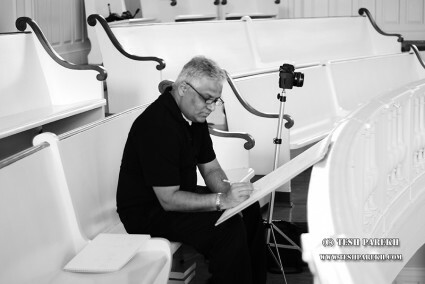 For me, drawing is the foundation of my paintings whether I am painting in oils or watercolors. Another aspect is the composition. I like to spend some time composing a wedding painting just as I would for any other painting or commission (one exception is the plain air sketches: more on that below). This makes my process little longer. But, as John Ruskin once said: all art is delicate. I liked this sketch and used it in the finished painting. 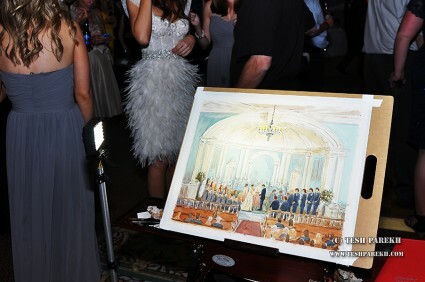 Jennifer wanted me to finish her painting at the Carolina Club reception in Chapel Hill. Here is the finished painting on my easel next to the dance floor. I enjoyed talking to many guests as I painted. I framed the finished painting and presented it to Jen and Ben. The couple was thrilled! Having a live painting of your event is unique! Like photography and video, a painting becomes part of your wedding memory. Painting from life is big part of my art. This is one of the recent plain air watercolor sketch. Painting en plein air is like taking a snapshot with your camera. Most of the times, I am more focused on capturing the essence of what is in front of me. Careful composition and rearranging of things is possible but optional. Sometimes the sketch stays as a plein air piece and sometimes I would use it as a reference for studio work. My favorite subject to sketch is my son Ian! I have made numerous sketches of him. This has trained me to sketch fast!